The 3D Waxmillers Gallery has over 600 pictures of pieces of cad jewelry created by my clients using the 3D Wax Mill CAD Jewelry Solution. Please spend some time to admire the work that has been done by these talented jewelers and consider how the 3D Wax Mill CAD Jewelry Solution can work for you. The 3D Wax Mill CAD Jewelry Solution was developed by R. Jeffrey Dunnington a Master Jeweler with 40 years experience. Jeff has used this CAD Jewelry system in his retail jewelry store for the past 6 years and has introduced and trained over 200 jewelers in the operation of the 3D Wax Mill CAD Jewelry Solution. After the completion of his 4th job on the mill, his investment was making a profit. The 3D Wax Mill Jewelers Solution includes, the MDX-15 mill/scanner, a Video training CD that will step by step instruct you in the basic use of the bundled programs, the 3D Wax Mill Rotary attachment, 8 micro carbide end mills, customized milling parameters, Sample designs, and membership to our private forum "The 3Dwaxmillers Club". The 3Dwaxmillers Club has become an invaluable resource for the use of the 3D Wax Mill. The topics covered and questions answered will introduce you to new CAD Jewelry design process and CAM Wax milling techniques from Jeff and the other talented members. Each of the members have developed their own style and techniques rooted in their abilities as Jewelers, Designers and Craftsman. If you have basic computer skills within a few short hours you will be able to produce a wax model that would be impossible or near impossible to hand carve. 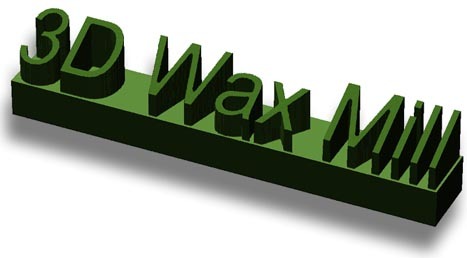 The wax models you will be able to create will open a whole new profit center for your business, save you bench time and you should realize a quick return on the investment that you made in the 3D Wax Mill System. With 3D Wax Mill you are not just buying a MDX-15. You are investing in a complete Jewelers Solution and your success. No other Roland dealer can support you as a Jeweler or make Jewelry like you will see in our Gallery.